Dry van containers, also known as standard or general purpose containers, represent the largest portion of the world’s estimated container fleet. In 2012, an estimated total of 20.5 million containers totaling 31.5 million twenty foot equivalent units (TEUs) made up the worldwide container fleet. 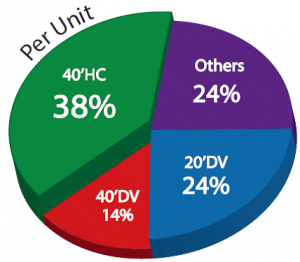 The 2012 world container fleet is broken down (approximately) below by container type; 20’DV, 40’DV, 40’HC and others. Approximately only 8% of the containers around are of the vintages for sale. 20’dry van units represented approximately 5 M units / 5 M TEUs of an estimated 20.5 million containers and 31.5 million TEUs in circulation. These units are generally used to carry heavier goods whose weight means that the containers will max out on weight before they do on volume. 40’ dry van units represented approximately 2.95 M units / 5.9 M TEUs of an estimated 20.5 million containers and 31.5 Million TEUs in circulation. These units (8’6’’ high), twice the length of a 20’DV can carry the same MGW (Max gross weight) and used to carry lighter goods. In the early years of containerization, 40’DV were the first larger units available to carry more volume then weight. 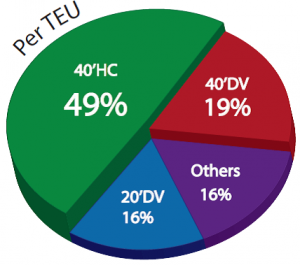 40’HC units represented approximately 7.7 M units / 15.4 M TEUs (twenty foot equivalent units) of approximately 20.5 Million containers totaling approximately 31.5 Million TEUs in circulation. These units (9’6’’ high), are 1 foot taller than 40’DV and can carry the same MGW (Max gross weight) as 40’s and 20’s. These units, first introduced in the late 80s, were designed to carry more of the lighter goods and were then considered “special” containers. They have gained so much in popularity that they now represent approximately 49% of the world’s container fleet capacity in TEU. It is expected that the proportion of HCs in the world container fleet will continue increasing steadily. Together these 3 types of dry van standard containers represent approximately 85% of the world container fleet. The others category of the fleet is made of specialized units such as refrigerated containers (reefers), open tops, flat racks and tanks. How many containers out there are actually for sale? Reading these numbers and all the articles that mention how many containers are left stranded in our ports – one might think sale containers are readily available. The answer is both YES and NO. Yes – there are a lot of empty containers in ports (waiting to be repositioned to where they can be used for cargo). No – they are not all for sale or sellable. We did say that the world fleet stood at about 31.5 million TEUs in 2012, but only a fraction are of the age group generally for sale. Typically operators amortize their containers over 10 years (a bit longer for leasing companies) and will then sell them in their 11th and 12th year. How many units they will decide to sell will depend on how much they need these older units or how much money is available for them to invest in new containers. In 2000, additions to the world fleet were approximately 1.4 million TEU, and in 2001 it was 1.1 million TEUs. Quick math would therefore mean that approximately 8% of the containers around are of the vintages for sale. So YES there are a lot of containers around, but approximately only 1 in 12 would be potentially sellable. Where to find containers for sale? Standard or Dry Van sale containers can be found in most major metropolitan areas, with a higher concentration in coastal and port areas. With supply and demand, containers are generally cheaper in coastal areas than in-land. Supply of second hand units is generally fairly steady but can be impacted by seasonal elements (e.g. hay export season in the PNW, seed or grain export season), natural elements (e.g. hurricanes decrease offering – increase demand), industrial projects or military requirements. New containers (AKA one-trippers) can also be found around the country. Supply of these units is generally dictated by the flow of goods from China that enables the positioning of the units to their resale location. Special containers are less readily available and therefore harder to source. Typically the highest concentration of “special” will be found in port areas and large metropolitan areas such as Chicago. The nature of local trades will also impact the type of specials that might be available. Open tops tend to be more readily available in industrial areas (e.g. Houston due to the oil industry, Chicago) and reefers will be more common in agricultural export areas (e.g. Savannah – due to large chicken exports). Supply and demand is the main driver of container pricing. While there are regular cycles that can be identified in the course of the year, stocks vary daily, and so can prices. Whenever you are looking to price a container or a project, it is important to clearly define and identify your time line. The longer to the project, the more risk that pricing might fluctuate. Containers are made to be transported and can easily be moved around. Due to the distances, you may find the costs of moving an empty container to where you need them may be fairly sizable. It is not unusual to see the cost of delivery of a container exceeding the price of the actual container. Transport costs are also subject to supply, demand and seasonal flows. With cargo flowing in and out of intermodal hubs, some trucking trade-lanes are more active one way than the other. It may be that the closest locations to find containers, is not the cheapest when it comes to trucking.